Maine Oxy is a proud supplier of the most welding and chemical accessories on the market today. Product lines are available at any of our store locations. Maine Oxy carries MIG guns from all major vendors. We also offer aftermarket MIG guns for your machines. CK Worldwide offers a complete line of industry standard torch models. LENCO electrode holders (upper and lower tongs) are made from a high copper alloy for maximum conductivity and strength. The advanced design of LENCO cable connectors offers many advantages over older styles. Cam action design of male half connector pulls the two halves tightly together. helps produce consistent welds and allows ground location to be easily changed. From small, home-based shops to the largest construction and industrial sites, our oxy/acetylene carts will put your cylinders where they need to be. Grade R or T hose designed for portable or production line welding. Used with oxygen and most current fuel gases. 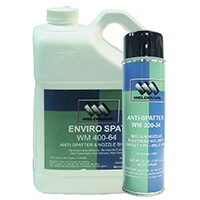 Find the right anti-spatter, coating spray, nozzle dip, or cleaner at Maine Oxy.